Our company offers an array of S.S Fruit Bowls that are used in both residential and commercial kitchens for keeping fruits and vegetables. Madhav Ratna Stainless Pvt. 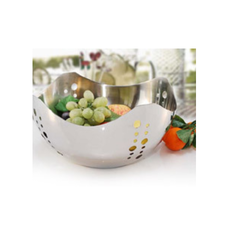 Ltd.
- Made using aluminium, this fruit basket has a perforated design and is a stylish addition to any dining table. 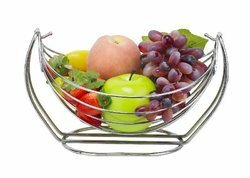 The fruit basket is made of aluminium and has a silver finish. To fulfill the diverse needs of patrons, we are engaged in offering to our clients a wide range of SS Fruit Basket. After checking quality, it is delivered to the client end. size - Dia 12" Hight 7"
- Quality made from strong and hard wire. We are also engaged in providing to our patrons, Stainless Steel Mini Fruit Basket. We offer finely polished stainless steel fruit baskets. This perforated arc shaped fruit baskets is nicely crafted for the serving elegance.